The Martian has been on my radar for years. I honestly have no idea why I didn’t read it sooner- perhaps because I was waiting to get a copy of it or other books kept distracting me from it. Whatever the reason, it isn’t a good enough excuse for not having read this entertaining and gripping book. 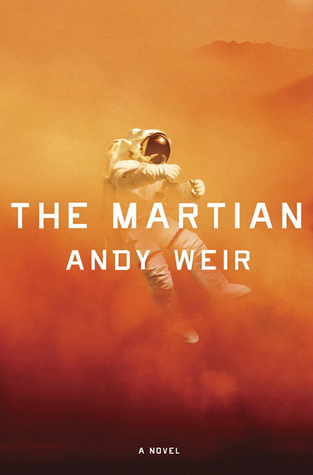 For some reason, I thought this book would be about Mark Watney, the main character, encountering aliens or other life on Mars. Clearly, I was mistaken. The genre of this book is interesting, because although its categorized as science fiction I think there’s less of an emphasis on the “fiction” part. Obviously it’s fictional, but it’s much more realistic and fact driven story than I first expected. The sheer amount of math and science in this book is incredible! I’m beyond impressed by the amount of research and crunching numbers it must have taken to write this book. Weir lets no detail pass by without proper inspection and analysis, making this a fascinating book to read from a scientific standpoint alone. Additionally, I was initially worried about this book focusing mainly on a single character. Won’t it get boring after a while? My inner worrier fretted. Again, I stand corrected. Watney’s personality is a gem among characters. He’s down-to-earth, mind-blowingly brilliant, and hilarious. It’s his great sense of humor that really brings the story to life. Several other perspectives also play important and frequent roles in the story, which was a pleasant surprise. You actually hear directly from NASA and learn how they’re handling the situation back on Earth, as well as from the rest of the Ares 3 crew who is still traveling through space to get home. These various perspectives add more depth and intrigue to the story, especially towards the ending. They are layered together carefully and thoughtfully, resulting in a story that flows seamlessly. Although the characters themselves are entertaining to read about, the plot itself is lacking that suspenseful edge I suspected from a science fiction novel. Instead of clinging to the book with a desperate desire to see what happened next, I was captivated by its entertainment value. It’s funny and Watney is oddly light-hearted for someone trapped on Mars all by himself, so reading it was simply enjoyable. Looking back, however, the plot itself is quite repetitive- something inevitably goes wrong, Watney cleverly fixes it, and everything is okay again. I yearned for a dire situation that would make me sweat a little more, but no such scenario ever occurred. I was also slightly disappointed by the anticlimactic ending- I felt as though I knew what was going to happen all along. I wanted a plot twist that would make me gasp with shock, but unfortunately one never came. Overall, The Martian both impressed and disappointed me, but the former outweighed the latter in the end. It’s wildly original and definitely entertaining, but the rather repetitive plot seemed pale in comparison to the vibrant characters. If you ever wondered what it’s like to live on Mars, then this is the book for you! My Rating: :0) :0) :0) :0) 4 out of 5 smileys. If the plot had been more exciting and suspenseful, I would probably would have given it a perfect rating! Would I recommend it to a friend? : Yes! Especially fans of science fiction or outer space in general. Have you ever read this book? What did you think of it? Are you excited about the upcoming movie adaptation? Let me know in the comments section below! I read this book last month and it instantly became one of my favourites ever! Watney is just hilarious! I was often reading the book in public, while commuting and stuff and I often had to make sure I didn’t just burst out laughing in a full train.